Back in the days of the early west, when cabin doors were secured from within by heavy bars, absent settlers offered hospitality to the occasional visitor. A leather thong attached to the bar inside the cabin was extended outside through a hole in the door. A pull on the thong lifted the bar inside and allowed the visitor to enter. This practice led to a western phrase of welcome which I extend to you here at my "cyber ranch," the latch string is always out. Come on in; let me show you around! Author of eight novels featuring the adventures of Deputy U.S. 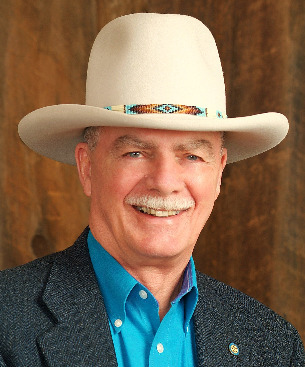 Marshal Merlin Fanshaw, Stan Lynde is a fourth-generation native Montanan and the creator, author, and artist of two highly acclaimed syndicated cartoon strips, Rick O'Shay and Latigo. Stan passed away in his beloved Montana on August 6th, 2013. He was a great talent and beloved by all that new him. He was a master story teller both in his story strip cartoons Rick O’shay, and Latigo and through his western novels, the Merlin Fanshaw series. His work speaks for the values he and his fans held so dear. As in his most famous syndicated cartoon strip Rick O’Shay “Happy Birthday Boss” Stan has gone on to be with the boss. His death is grieved by his wife Lynda, family, friends and fans.